Van Tongeren America unveils a dust collection system proven to remove more than 99 percent of particulates from an airstream to meet all applicable environmental emissions standards. Featuring a proprietary design that controls the airflow direction through the baghouse, the dust collection system sets the gas entry inlet near the top of the pulse-jet collector and directs a portion of the particulates into the hopper below before contact with the filter bags. Dust load on the bags is reduced, their service life extended and downtime for maintenance minimized while a smaller unit on a more compact footprint may be specified than with traditional baghouse systems. 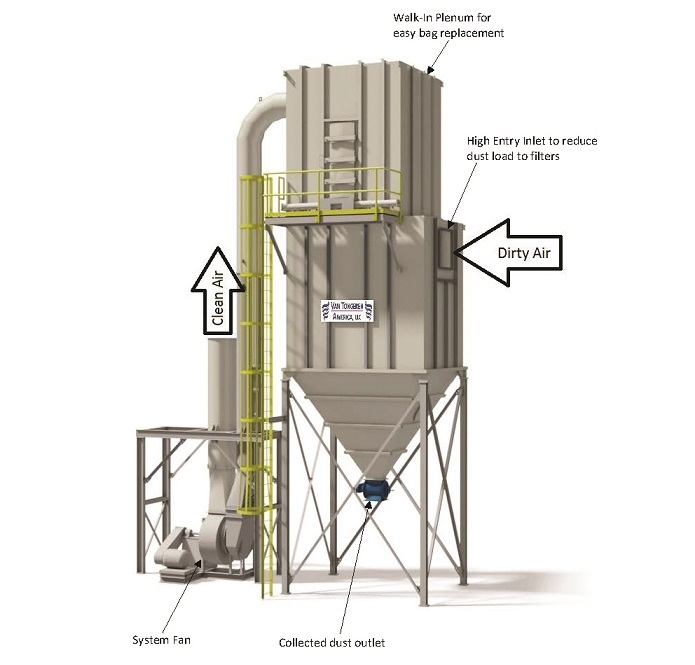 Developed to provide the final cleanup step in dry particulate screening and classifying systems, the versatile dust collector is ideal for capturing fine particles from processing aggregates, manufactured sand, cement, lime, salt, fertilizer, and a variety of other materials at a wide range of temperatures. The modular system is available in a choice of nine different standard sizes plus custom sizes to match the proper amount of filter bags and cloth area with the airflow rate and dust load. The pulse-jet fabric filter systems are designed at the company's Lebanon, PA headquarters to suit each, individual installation. The dust collector may be specified as part of a complete classifying system or may be retrofitted on systems in the field from any manufacturer.